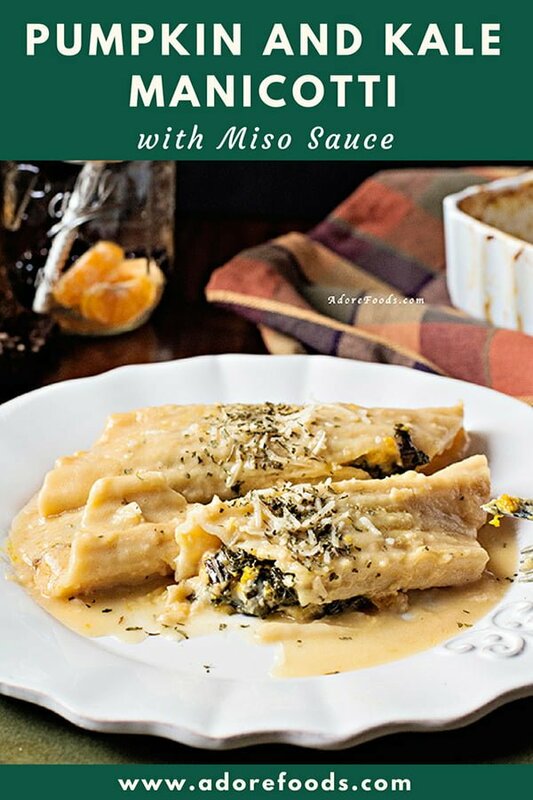 Creamy baked pumpkin and kale manicotti with miso sauce is nothing short than perfect dinner recipe! 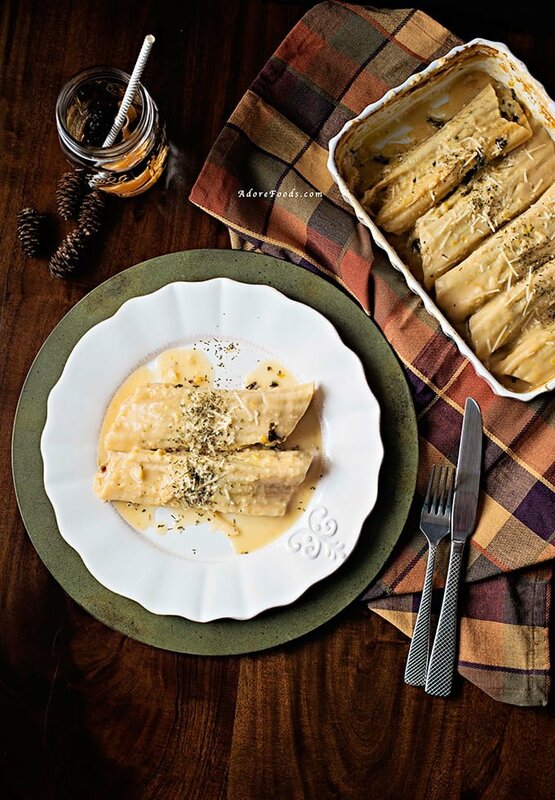 My Baked Pumpkin and Kale Manicotti with Miso Sauce recipe is just one small, tiny preview of what you’ll find here in October. October at Adore Foods is Pumpkin Around the World month. I am going to take you places you’ve never been to without leaving your home to try amazing, not so well known, recipes. It is going to be a crazy good culinary adventure! For my recipe today, I have used my favorite pumpkin of the season, known as Buttercup Squash in US and Kent Pumpkin/Jap Pumpkin in Australia and New Zealand. It is sweeter than most other types and it’s just great roasted with some drizzled olive oil on top or used in hearty, warm soups. I added some fresh kale to make the super healthy filling for my baked manicotti. Remember I said will try to include more kale in my dishes? 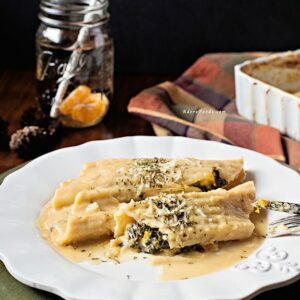 It turns out, I am addicted to kale and pasta combination 🙂 But, trust me, this creamy baked pumpkin and kale manicotti is nothing short than a perfect dinner! It is not challenging at all to put it together, although it may look a little bit sophisticated. Now, let’s get to my favorite part of the recipe and the surprise element … Miso Sauce! The saltiness of Miso sauce balances just perfectly the sweetness of roasted pumpkin, making this dish PERFECT. 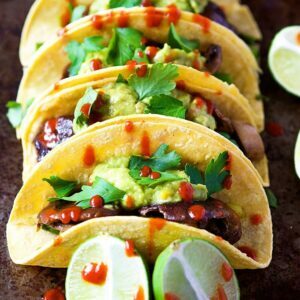 A paste made from soybeans (you may want to look for an organic paste) sea salt and koi (a mold starter), and often mixed with rice, barley or other grains. The mixture is left to ferment anywhere from 6 to 36 months and the whole process results in a savory paste that ranges in color from yellow to reddish-brown to dark brown to black. Miso has a surprisingly sweet and salty flavor and can be used to add depth and flavor to soups or to make sauces, marinades and even salad dressings. Just grab a seat, a fork and join me! Preheat oven to 400F/200C. Cut the pumpkin in half and discard seeds. Cut every half in thick slices (1 inch/ 2 cm) and place them on a baking sheet and brush them with olive oil. Bake for 30 to 35 minutes, or until tender. Remove from oven and allow to cool. In a large pan add 2 tablespoons olive oil. Add chopped onions and cook for 2 minutes. Add garlic and sauté for 1 more minute. Add chopped kale and cook for 2 minutes, stirring often or until wilted. Spoon baked pumpkin into pan with kale and stir to combine. Remove from heat and add grated Parmesan. Season with salt and pepper. Let cool. Cook Manicotti shells as stated on the pack. Drain and place on a baking sheet to cool down. Grease a large baking dish. Fill Manicotti shells with the mixture, carefully not pressing too much filling to break the shells. Place them in prepared baking dish. Melt butter with miso over medium heat. When butter begins to foam, stir in flour and cook for 1 minute. Whisk in 1 cup hot water at a time and mix until smooth. Whisk in cream. Bring to a boil and simmer for 2 to 3 minutes or until slightly thickened. Pour sauce over cannelloni, they will be fully covered. Cover with foil and bake for 40 minutes. Take out the baking dish from the oven, remove foil and top with some panko breadcrumbs and parmesan cheese. Return to oven and cook uncovered for 10 more minutes or until bubbling and golden. Remove from oven and spread some fresh chopped parsley. 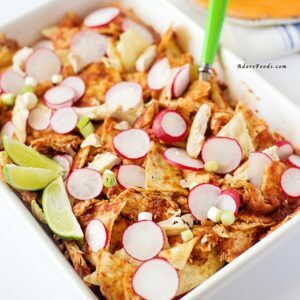 This recipe is adapted from Food and Drink Magazine. O..M..G, butter and white miso with cream, pumpkin and kale filling. This is definitely a great new spin on traditional manicotti, DELISH!! Such a stunning dish! I’m so curious about that miso sauce! 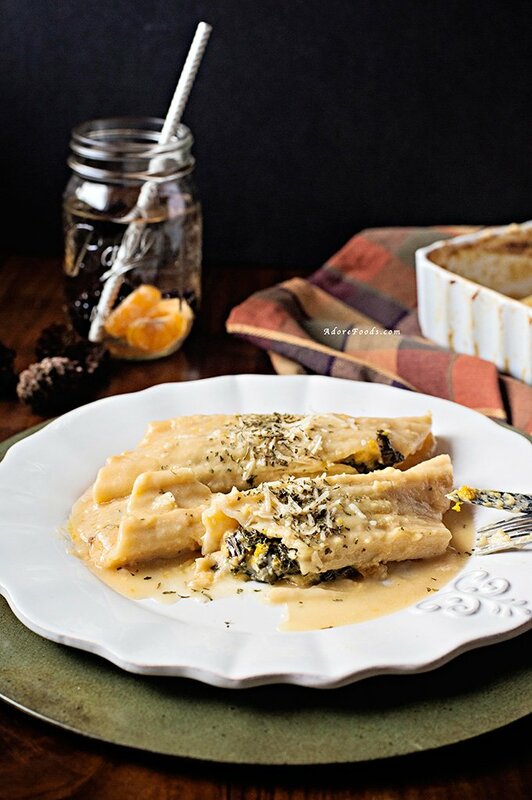 Pumpkin & kale manicotti?? Yes, please! 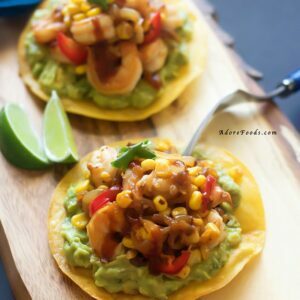 Love all the ingredients in this dish! Perfect! Pinned! This looks incredibly good and delicious. 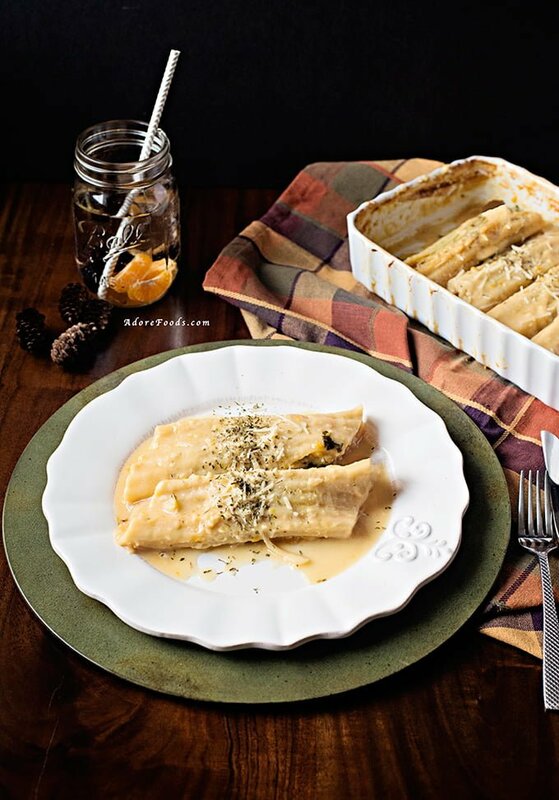 My husband loves manicotti so I am saving this recipe to make it for him! What a great fusion of such diverse flavors! I bet this tastes incredible! 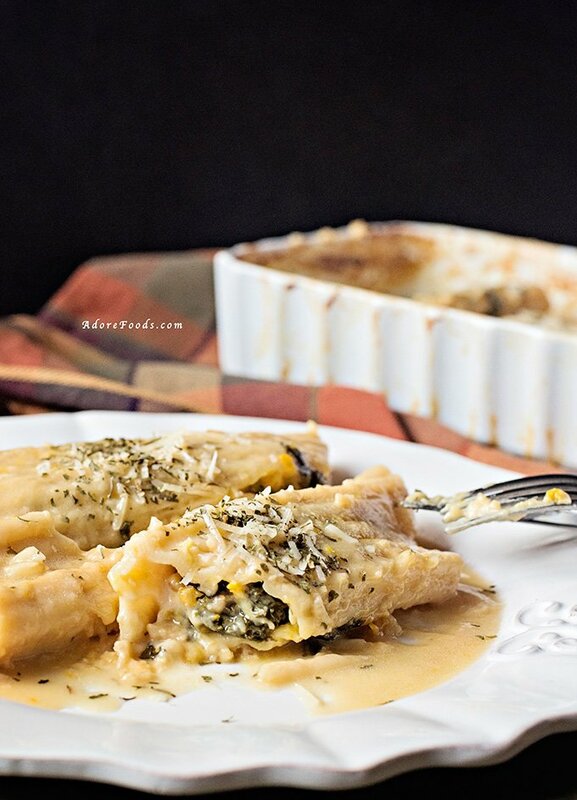 This baked pumpkin and kale manicotti has to be one of the best fall dishes we have seen so far; great job! Hi Lindy! Thanks for stopping by! I didn’t peel the squash. I baked it cut in slices and then scooped the flesh out. You’ll see it comes out really nice. Ups! Definitely, not “panic” breadcrumbs ..it should be indeed panko breadcrumbs…ah! this autocorrect is killing me. Go back right now and fix it! Thanks for letting me know. I hope you’re going to love it! What a beautiful pumpkin dish, Oana! Really cool that you incorporated miso into a pasta dish. I’m dying to try this. I think I will use kabocha (Japanese pumpkin) to make it even more Japanese. 🙂 I’m excited to see what pumpkin dishes you are going to make this month. What a beautiful autumn dish! I love the sweet/savory/umami flavor miso can add to a dish… nice touch. I look forward to seeing what other kind of pumpkin dishes you come up with! What a wonderful seasonal dish ! Fantastic flavors i love it! Such pretty pictures and the dish is so much of a comfortfood – Yummm! Never would I ever have thought to combine those flavors! How creative! Amazing flavors. And amazinggg photography to match! This looks amazing 🙂 Miso butter cream sauce with pasta. So going to be trying this. This looks so interesting! I’m definitely going to try making this at home. The miso sauce sounds delicious! Thanks so much for sharing!